If you can believe media reports, Bill Gates is “saving lives” everywhere he goes, and everywhere his money reaches. Just keep in mind that many of the media outlets reporting on the activities of the Bill & Melinda Gates Foundation are anything but unbiased — in fact, they are directly sponsored with Gates Foundation grant money and/or partnership programs. No wonder the coverage is so glowing that Gates, who frequently meets in secret with David Rockefeller, Ted Turner, Michael Bloomberg, George Soros and other billionaires to plan population control, is often literally portrayed as a superhero, saint and savior. Yet, Bill Gates real ties are to the eugenics agenda, including the fact that his father, Bill Gates, Sr., who co-chairs the Bill and Melinda Gates Foundation and shapes its priorities, was formerly a member of Planned Parenthood’s national board. A sponsored blog at ABC News, for example, was titled “Be the Change: Save a Life,” selling a crafted message that Gates is rescuing the poorer parts of the world. Another ABC News package brushed off conspiratorial notions about Gates’ secret billionaire population meetings, instead dubbing he and his wealthy cohorts as the comic heroes ‘Superfriends‘. 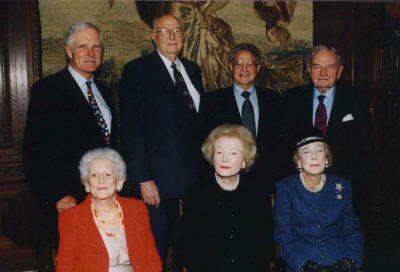 Billionaires for Population Control: Bill Gates, Sr. (2nd from left), co-chair of the Bill and Melinda Gates Foundation and father of the Microsoft founder, is pictured next to Ted Turner, George Soros and David Rockefeller who’ve all heavily donated to depopulation efforts. Behind that façade — created in part with positively-worded paid media portrayals — Gates is part of a heavy-handed push to force GMO foods (whose patents are owned by Big Agra and Big Pesticide) on the world while urging global vaccinations, even in places where they’re not wanted, and where they may be doing a great deal of harm to human life. In just one shocking example, Indian doctors have alleged that polio vaccines pushed by the Gates-led GAVI alliance have paralyzed some 47,500 people.